The AUX Collective would like to THANK Anthony Johns for his work with the My Logan Story! Here is a video highlighting the thoughts and emotions collected by the students during the Comprehensive Planning process for the Logan section of Philadelphia. 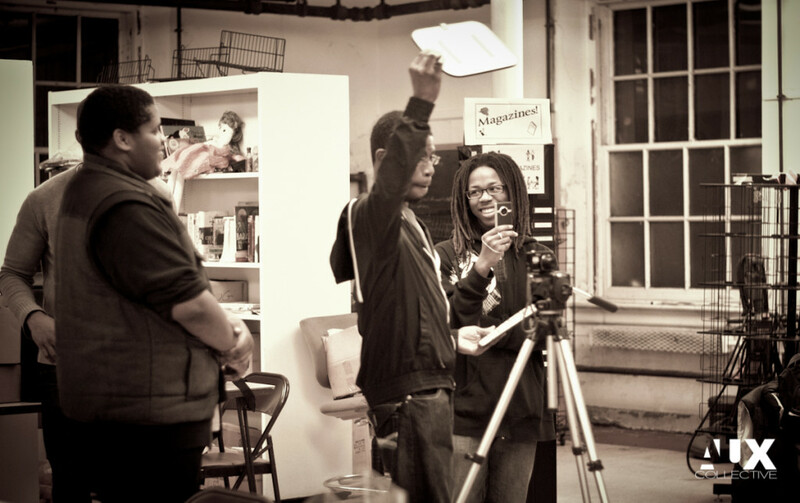 Starting in November 2013, the Logan CDC and their planning consultants from WRT assembled a group of youth volunteers to work on an exciting multimedia project to tie into their previous My Logan initiative. During the comprehensive planning process, the students were able to capture stories and images that paint a vivid picture of the history and emotions of the Logan community. My Logan Story from Anthony Johns on Vimeo. 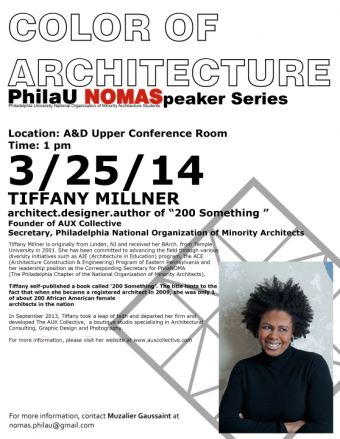 Tiffany Millner, AIA is appointed to the 2014 AIA Diversity Council! The AIA remains committed to increasing diversity and inclusion within the organization and the profession. To that end, the AIA Diversity Council, a presidential-appointed committee, has been established to push diversity and inclusion initiatives forward. This year’s Council will be chaired by Wendy Ornelas, FAIA, and Miguel del Rio, AIA, returning co-chairs from 2013 and 2012. Areas of focus for the Council will continue to include women within the profession, multiculturalism, and pathways to the profession. 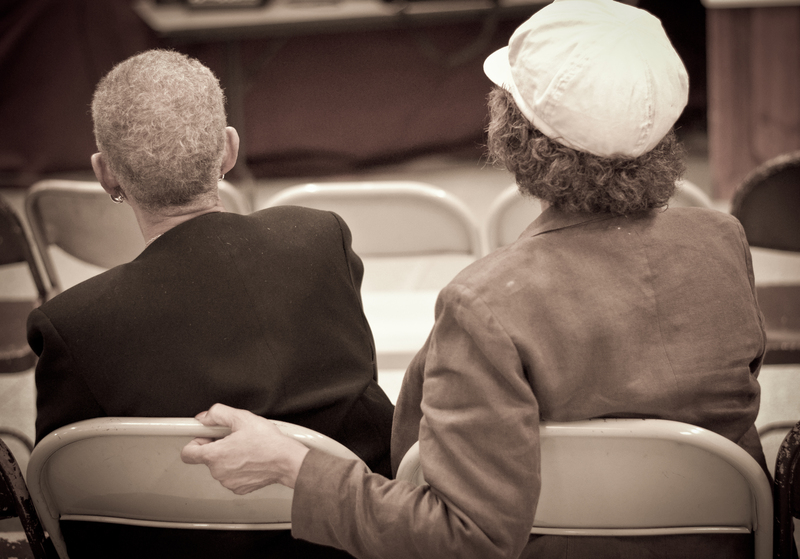 The 2014 NOMA conference is coming to Philadelphia! Visit www.lovenoma.com for more information! PhilaU NOMAS returns with Color of Architecture Speaker Series hosting Tiffany Millner on March 25th, 2014 at 1 pm in Architecture & Design Center! In case you didn’t know – In September 2013, Tiffany took a leap of faith and departed her firm (JKR Partners) after 10 years of employment in order to pursue her dreams and develop her own brand. It was at this point that her energy shifted and The AUX Collective was further developed into a boutique studio specializing in Architectural Consulting, Graphic Design and Photography. Current projects include owner’s construction representation and architectural consulting for large renovation projects, development of a student-led community journalism team in the Logan section of Philadelphia, full branding and identity (including logos and web design) for emerging artists and companies, and photographic documentation for community synergy events in PA and NJ. My boys have been doing their thing and I am so excited about what they have accomplished so far!